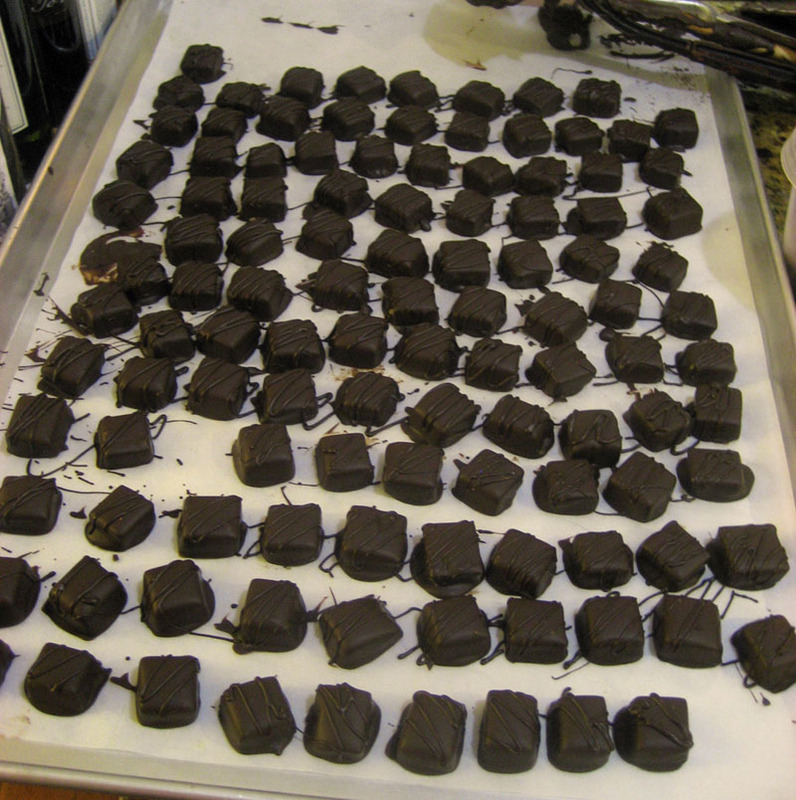 Dipped the first batch of caramels and the chocolate covered macadamia nuts tonight; tomorrow sometime I’ll do the second batch of caramels. 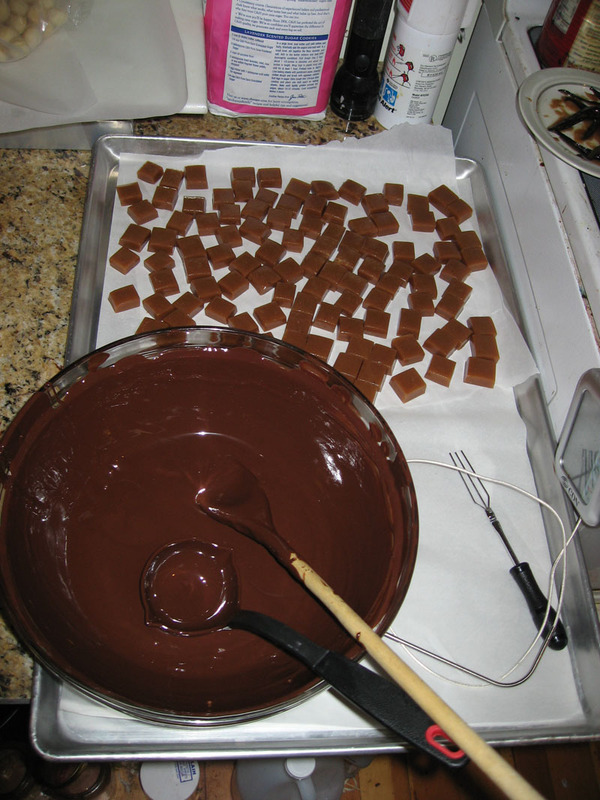 The first shot is of me tempering chocolate on the new granite slab; the second one is the caramels and the bowl of chocolate (note that most of the chocolate is still on the granite slab at this point, so there’s very little left in the bowl); the third one is the finished caramels.Â It still looks a little messy but once they’ve been put into candy cups and boxed, they should look much neater. The granite slab is working just dandy – like the marble slab but without the scratches and pitting.Â I scrubbed it down with a wet towel, then with paper towels (I don’t like using sponges to prep surfaces that can’t be rinsed under running water – too many bacteria in sponges), then finished it with a wipe with isopropyl alcohol to kill any remaining germs.Â I’m pretty sure that killed off anything that came from the dust at the granite supply place. I also got in two twenty-mile rides this weekend, so I’m feeling pretty good.Â Next week I’ll try to bike commute 2 days (1-1.5 hours each day) and do a thirty or forty mile ride on Sunday.Â Saturday I have a weaving study group to go to, but will try to sneak in a short ride. In between riding and chocolatiering, I have created the first muslin for my first attempt at drafting my own pattern!Â It is a bra-style princess line strapless top, and right now the top of the bra is too shallow (exposing a little too much cleavage) and the bottom is too deep (goes beyond the cup of the breast).Â I’m going to modify it over the course of this week and hopefully by next weekend I should be able to cut and sew the brocade bodice.Â After that, it’s time to apply feathers! I must say, it’s very freeing to be able to create your own patterns.Â Thus far I’ve been making lots of errors, resulting in lots of rework – but I’m learning a lot and it feels wonderful to be so free with design.Â I wish I had more time to work through the exercises in my book on fashion design. Nothing on the weaving front this weekend, but I hope to get some good weaving time in during the week.Â It’s going to be a busy week, though, between starting a new job, continuing work on the old job, finishing the chocolates, sewing my muslins, and training.Â I might be able to finish the goldenrod shawl, and do some more exercises from Bonnie’s book. Off to bed!Â Tomorrow I start my new job. Beautiful! Except now I have to wipe drool off myself! Huzzah! Thanks for posting that. I now have a better concept of what the process looks like. I plan on starting this weekend. I have a stupid question. 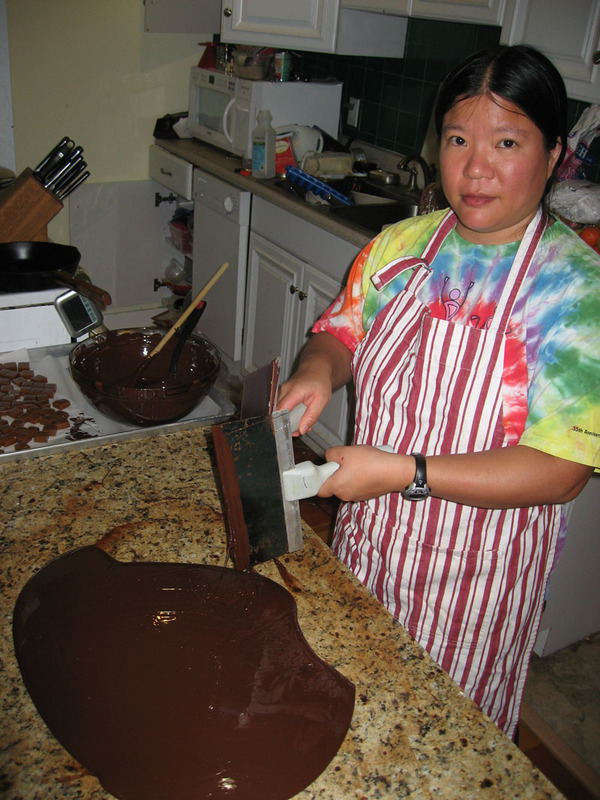 Is the better quality baking chocolate (Ghirardelli) good to start out with? Or has that already been tempered? I guess that’s two questions… 😉 Thanks! All chocolate is tempered when you buy it – it’s only when you melt it down that it loses its temper 😉 Ghirardelli chocolate is usable but it is very, very thick (high cocoa/sugar content and low cocoa butter content) – I haven’t tried working with it in the last fifteen years so I’m not sure how it works up. It does mean that if you are dipping chocolates or dried fruit or anything else in it, you will get a thick coating of chocolate – not that that’s a bad thing!